Something interesting happened for once. I bought the material to make the seat. As you can see it's yellow. Like I said before, yellow is the name of the game. I'm not going crazy with yellow on the bike but... If you know me than you know I love me some yellow. Mariah and I will be making the seat as sort of an experiment to see how it looks. If it doesn't work, well it's only $30 lost for material cost. 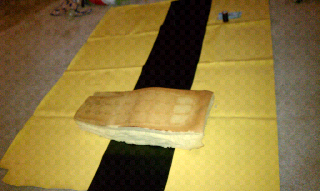 Yellow with a black stripe in the middle. Let's see how it goes.